…. 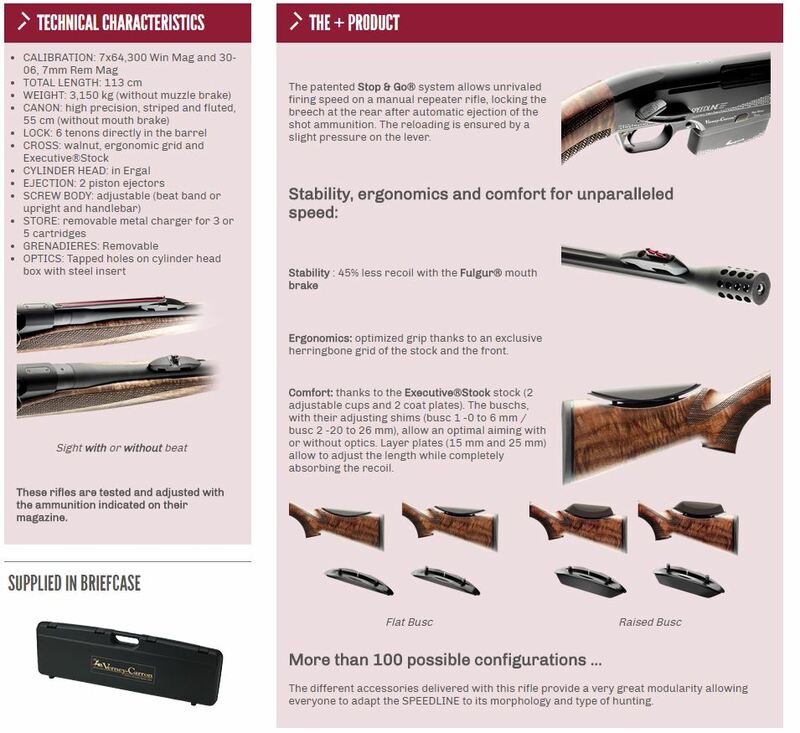 is proud to present to the discerning gun owner the latest in lever action technology: The Speedline – by Verney Carron. We welcome retailers of all sizes to participate in this presentation to your customers. The much talked about Speedline is available in 30/06, 300 Win Mag, 7mm Rem Mag calibres and the 12 Gauge Veloce. All stocks at this stage are of timber, with a Synthetic alternative available in late 2018. They are available in both right and left-handed versions. The stock and frame are straight and the ejection port on both L/H and R/H is on the right hand side. The short throw operating lever for the action is located on the left hand side of the action for the L/H version. Magazine capacity is 5 in the removable box magazine supplied. All rifle calibres have a factory fitted muzzle break. Scopes are fitted via a Weaver style base mount. The Speedline comes with its own full-length plastic rifle case, extra high comb for adjustment to the rear stock and extra recoil pad and barrel thread cover. Verney Carron through its sole Australian distributor, Australian Sporting Agencies, will provide a 5 year mechanical warranty on the Speedline products to the original purchaser of any Speedline.